I Found My Tomorrow in Paris is available in print and on Kindle! Buy it today! Behind the scenes tales of San Francisco’s legendary Iron Horse restaurant, as told from the horse’s mouth. Born in a Nebraska Farmhouse I was a member of the greatest generation living the American dream. At midlife it all evaporated. I was left with decisions to be made that seemed unsurmountable. While my escape to France does not define my life it had a profound effect on me. All my thoughts—in fact my life— was laid bare to be painfully examined and redefined. With perseverance and faith I came to understand and accept what I had become and discover a new me with its incumbent peace. Upon my arrival home, to San Francisco, I felt like a flower which has opened up to absorb all that life has to offer. Sometimes we are the last to realize what our souls are starved for. Or maybe we do know, but we’re too fearful to risk what is safe and dependable for the challenging unknown. Sometimes life needs to turn on us to get us moving and considering risking everything. Beyond the shores of my reality, where for three decades I faithfully performed my role as wife and mother, another realm awaited me. A realm of ancient history and personal discovery, of architectural grandeur and intellectual broadening. But in the daily patterns of my earlier years such an exploration into who I really was and what all I was capable of accomplishing was not at the forefront of my thoughts. In the 1950s, my life was simple and grew only to a shelved status culturally determined for girls who married right out of high school. This cup consigned to me kept filled without much ado really; never overflowing, it merely teased at the lip. But life that centered round home and hearth contented me, satisfied as I was deemed to be with what I’d now describe as a homogenized expectation for women in that period of American life. It wasn’t until my divorce and a trip to South America that I was awakened to the possibilities of more. South America had captivated me with its beauty, its exotic bouquets of people and sounds, colors and scents. Returning home then, the grass felt more alive between my bare toes, just as it had in the days of my youth. Clouds were no longer inching overhead. They hastened now, as if dashing for some longed-for destiny. Fog rolled in with determination, shrouding the hillside below my coastal home. It settled so thick beneath my deck I felt I could walk out into forever. If I would just take the step I would come face to face with whatever was out there that beckoned me. And something was beckoning. I yearned for more. But more of what? For several years more I clung to ‘safe’ and ‘dependable,’ until it all evaporated like a dream at first light. Yet my overturned world did not leave me without options; oddly, it presented me with a persuasive opportunity. A journey, as it would turn out, that would be my true coming of age, my second flowering. Behind the scenes tales of San Francisco’s legendary Iron Horse restaurant, as told from the horse's mouth. After her stint in France (I Found My Tomorrow in Paris), Marilyn settles in San Francisco where she eventually meets and marries Leo Giorgetti, the charismatic owner of the Iron Horse from 1954 to 1973. This is the humorous and heartfelt story of Leo and the birth of "The Horse" as seen through "The Horse's" eyes. "From the Horse's Mouth" is a slice-of-life peek into a bygone era when the martini was the drink of the day and hats and white gloves where de'rigeur for the ladies. We rub elbows with the likes of Joe DiMaggio and the famous sports figures of the day and join in the pulsing energy of the standing-room-only crowds. Spontaneous visits from celebrities such as Liberace, Sammy Davis Jr, Lou Rawls or Maria Callas, as she serves salad to the customers, are the norm. One beautiful morning, Leo opened the doors at 11:00 as usual when an apparition resembling Popeye’s Olive Oil walked in and headed for the bar. She was a sight to behold, wearing a flimsy bathrobe with slippers on her feet and her stringy hair attempting to escape from a “snood” (a flimsy hair-net popular in the 40s). Leo approached her with trepidation. He cautiously greeted her and naturally asked her wishes. “I wanna drink,” she said. When told the bar was not open yet she launched into a tirade of profanity so vile it made Leo take a step backward. In her delivery of this litany and while calling Leo every name in the book, her robe was not doing the job it was designed to do and it was obvious to Leo and Pucci, the bartender, that she had nothing on underneath. Leo thought "Uh oh, I'm in trouble..."
On December 11, 1941, four days after the Japanese bombed Pearl Harbor and the United States entered World War II, Leo turned twenty-one… he joined the Coast Guard… So it came to be that he was stationed at Orick, California, situated on the northern coastline. During the war it was common, in fact it was often necessary, for servicemen to hitchhike across the country from base-camp to home when they were on liberty. Leo was no exception. His only means of travel was by standing on the shoulder of the lonely two-lane roads and sticking his thumb out in the direction he wanted to go. Her life in chaos after the termination of a 30 year marriage, this adventurous woman chucks it all and escapes to France to find some meaning to the second half of her life. Not knowing a soul or the language, and step by divinely-led (sometimes comical, but always-challenging) step, she re-shapes her life's course despite a letter from home which threatens to disrupt her journey. Not wanting a frivolous life on the Cote d'Azure, she moves to Paris. What she encounters there, after a serendipitous phone call and a chance meeting with an American business man, is far more then her wildest imaginings. She delves into her past to find her tomorrow. Finally, what she sees on television beckons her home.A story of friendship, betrayal, and discovery of self. "While I had envisioned living in an architecturally significant, even romantic edifice (And why not dream?) I find my new residence a rather drab and mediocre building. It seemed enough that I was in France, living on the Côte d’Azur. Naïve reasoning reassures me though that I can always move if I should find something more…well, French... Now, what could be called the kitchen really is a nook with a bar-sized sink. Not four burners—as is the norm—but a two-burner range, a miniscule fridge, and a few skinny cupboards. No gourmet meals prepared in this space. I guess I can stand to lose a little weight. Still, I won’t be able to avoid the kitchen entirely. Necessity will force me to use it on occasion. Necessity also demands some groceries. Soon. With my head in the clouds and feeling giddy, I grab a cart and proceed to fill it. I need everything. Decadent and exotic merchandise surrounds me, things I cannot buy in the States: creamy chocolate spread (wow! ), confiture de figue (must be fig jam) and, oh, my goodness! —the milk cartons are not refrigerated. Like the proverbial kid in a candy store I mosey down the aisles, anticipating some glutinous eating back at my new apartment and paying little mind to the other shoppers with tote bags over their arms. I continue to thread my way between stacks of merchandises, plucking various items from their shelves and steering my brimming cart to the nearest checkout stand. To my amazement the clerk hands me several small plastic bags. What are these? She wants me to bag my own groceries? I plead timidly, “But these are très petites. Unmoved and without so much as a glance my way she points to some larger bags, any of which I can buy for two francs each. I buy three. But she’s not finished. She rambles something off in French, all the while jabbing the air in the direction behind me. Bordering on panic, I glance in the given direction then back to her. What is she trying to tell me? Again, I look over my shoulder. All I see is the produce section. Nothing. I look back at her. Still nothing. But from behind me, whispers of “Américaine” have me turning around yet again. Impatient shoppers have since lined up, each one shaking his head. Then, ah. Beyond their wagging heads and prominently displayed in the produce section—a sign. In French, naturally. ALL PRODUCE MUST BE WEIGHED AND MARKED BY THE ATTENDANT. Mon Dieu! I rush past the line of grim faces to the produce clerk who carefully weighs and marks my little treasures. By now a wave of heat has spread over the back of my neck, and even my ears feel hot. I rush back to the clerk in a state of sweltering humiliation and toss my remaining groceries—in their très petite bags—onto the counter, which has not stopped moving in my absence. I search the counter area, but…where are my other groceries? My face is pulsing now with heat and blinking, I imagine, like a neon light: Look! Look! Américaine! The cashier tallies my bill, and finally she looks at me. Totally distraught and not about to hold up the line a second longer, I press my money into her extended hand, hoist what few goodies I have, and start for the exit, my eyes fixed straight ahead. I cannot walk fast enough back up these linoleum steps, thinking how the smallest things can so quickly shatter a confidence. The closer I get to the doorway I feel the outside air starting to cool my face. I draw in a slow, steady breath and try to regain my composure. Out into the street the first tiny drops tap my nose and cheek. I look up. Apparently, I misjudged the weather too. Very dark clouds are about to give way. I hug my Tres petite bags to my chest and dash from the site of my disgrace for home. I just hope the bags that are getting soaked will hold together. No such luck. Worse. My bags burst over the counter top, and in the solace of my kitchen nook I delve into the soggy mess. No Swiss cheese or oranges..."
"While October brought the beginning of school, it also heralded a change in the weather. The sun softens earlier. Sometimes it completely disappears under low-hanging overcast skies that grow more and more somber, until darkness envelops the city. An eerie mist slithers up then, from the river to the streetlamps, and casts reddish haloes over the boulevards. It’s another world after dark.... Weekly mornings, on the other hand, run on the predictable rhythm of ritual. Each near-dawn the alarm clock gets me up and about my morning ministrations: a thank-you meditation, a shower, maybe some yogurt and a banana, then off into the pre-dawn darkness for a short walk along the Champs Élysées. After two blocks, I venture down into the truly dark bowels of Paris for the metro, in which several passengers and I sit trance-like until our underground destination. From there we disembark and scurry through dimly lit tunnels past vendors hawking their wares and, eventually, resurface into the still-dark Parisian mist—like rodents venturing out from our holes. My destination? Boulevard St. Michel. I follow along the bank of the Seine. The Seine... It reeks of centuries of use, lost lives, and eons of waste. The muddy, unforgiving flow advances along its course, an innocent receptor of untold atrocities. What forbidden secrets it must hold. The river begs forgiveness for its part in receiving spoils of hundreds of decades of abuse. Yet its mindless, soothing surge forgives all and accepts its destiny—a landmark of truth. From across this flowing dark mass the bells of Notre Dame toll out the hour. One… Two… Three… Eight reverberating bongs. I stop to gaze at its illuminated Gothic towers and listen. I feel heaven’s angels all around me in what feels like timeless, unnatural peace. This spiritual something stays with me for two blocks more. It lingers as I step inside the building of education and clump three flights to my classroom. It lingers, until I fix the ear-phones to my head and hear the first drone of “Maintenant étudients. 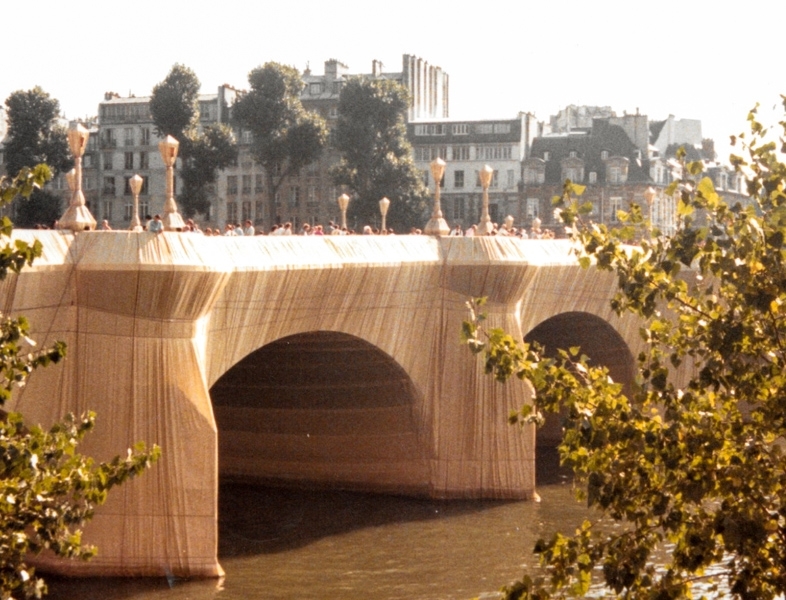 Répétez.” The exchange of realities is instant, and repetition is my world for the next several hours..."
In 1985, Christo and Jeanne-Claude wrapped the Pont-Neuf, the oldest bridge in Paris. The artists' vision for the project was conceived in 1975. It was the last time they had an idea for a wrapping. Marilyn's afternoon tea group in Paris, her friends Beryl and Monique are pictured. Marilyn's good friends Ursula and Vally. Marilyn and Yves Saint Laurent's niece Cecile. Marilyn and her friend Marji. Marilyn, her sister Loraine, and friends Monique and Karin. "A wonderful memoir about a plucky middle age woman who, after child rearing and marriage, finds the desire and freedom to seek her own dreams. She sets off on the adventure of a lifetime in France while changing the course of her future. I enjoyed accompanying her as she dined in Bistros, walked the promenades, learned the language, and became a student at the Sorbonne. 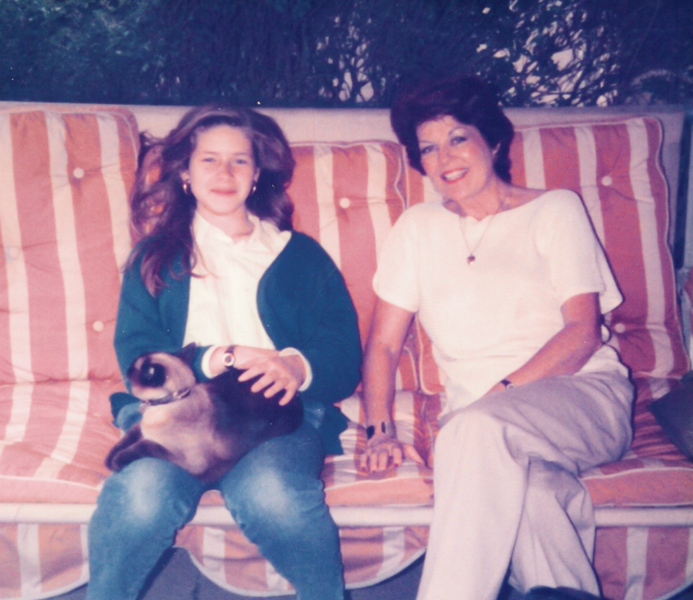 I admired her determination as she navigated the challenges, setbacks, and joys of establishing herself alone as a French resident and starting anew. A quick and inspiring read!" - Amazon Reader Jill M.